Broward County election officials will have to disclose how many ballots are outstanding and yet to be counted, a federal judge ruled in Florida. Judge Carol-Lisa Phillips of the 17th Judicial Circuit of Florida ruled in favor of Republican Gov. Rick Scott, who filed an emergency complaint late Thursday night against Broward County Supervisor of Elections Brenda Snipes. The ruling allows for an immediate inspection of the most current information on the number of ballots both already cast and still uncounted. Scott and incumbent Democratic Sen. Bill Nelson are in the midst of a razor-thin race for Florida’s Senate seat. This Oct. 23, 2018 file photo shows Sen. Bill Nelson campaigns in Orlando. Florida Gov. Rick Scott has spent tens of millions of his own money. He has tried to make the election about Nelson’s lengthy tenure in Washington. Philips ordered the information be made available by 7 p.m., but even after midnight, Scott’s campaign told ABC News Broward County has not disclosed how many votes are still outstanding. Scott’s campaign and the National Republican Senatorial Committee will also have access to those ballots, per the judge’s ruling. The county faces a noon deadline Saturday to send unofficial preliminary results to the state. Scott spoke to Sean Hannity on Fox News Friday night and said Nelson was trying to “steal” this election. 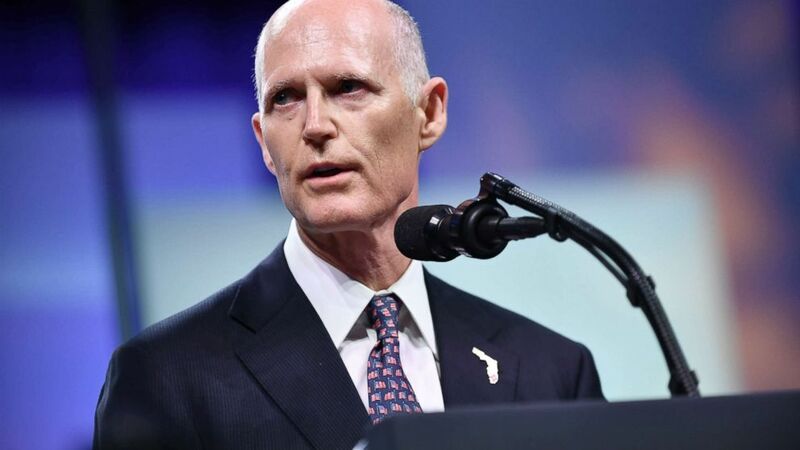 “Bill Nelson’s lawyers, who is trying to steal this election, they went to federal court today trying to get the certification postponed,” Scott told Hannity. “They were not able to do that, so basically tomorrow, my win will be certified by the court subject to a recount. Snipes’ attorney Eugene Pettis argued in court that the lawsuits were an attempt by Scott and the NRSC to slow things down. “Whether they’re saying it or not, they’re interfering with the counting process, which should be Dr. Snipes’s primary responsibility,” Pettis said, arguing that Snipes is not denying the information should be made public but that she had only 26 hours to get her job done. Pettis disputed Scott’s earlier comments about the fundamental importance of protecting the vote. “I think there’s something equally fundamental, which is to count the vote,” Pettis said. Scott’s attorney Jason Zimmerman noted that his clients were not requesting Broward County stop counting votes. “This is a simple request that the supervisor of elections should have provided,” Zimmerman said. Scott has filed another lawsuit in Palm Beach County, which has also not finished counting its votes. A narrow margin in the votes cast in the divided state has Florida gearing up for recounts in both the gubernatorial and senate races. Nelson has not yet conceded to Scott, who currently leads by less than 0.2 percent with ballots across the state still uncounted. State rules mandate a recount if the margin is less than 0.5 percent, which looks entirely possible as Broward County and Palm Beach County, both Democratic-leaning counties, haven’t completed counting mail-in ballots — and one of them hasn’t finished counting early ballots, either. Many more counties continue to count provisional ballots. Counties face a noon Saturday deadline to report preliminary results to the state and thin margins could trigger a recount could come as early as then. Scott carried a larger lead Tuesday night, but continues to see it dissipate as more votes come in. Scott has responded by accusing county election supervisors of corruption. A win for Republicans in Florida’s senate race would only add to the stinging loss of three key Senate seats on Tuesday night in Indiana, North Dakota and Missouri, which are all states where Democratic senators faced re-election in states Trump won in 2016. But in Florida, where Nelson is awaiting results against Scott, Trump won the state by less than 1.5 percentage points.